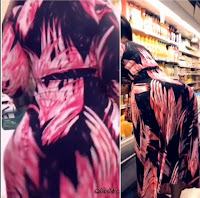 Friday, February 8, 2019-This beautiful lass with a heavy load behind her back broke men’s necks in a supermarket when she goofed around showing what her mama gave her. God definitely took His time when creating her. Imagine there is a man somewhere who samples these goodies and is probably tired of feasting on them.